Cynthia McKinney: We have plenty of money for programs; it�s just misallocated. Ralph Nader: Half of federal budget is now military spending. Ralph Nader: Ban desecration of the Constitution; not flag desecration. Cynthia McKinney: Astounded at the corporate influence in Farm Bill. Ralph Nader: Corporations have too much control over people�s lives. Ralph Nader: Corporations control government; that defines fascism. Cynthia McKinney: Something wrong with $38B on education & $700B on defense. Cynthia McKinney: Leave the oil in the soil. Cynthia McKinney: Add organic farming, sustainability, and GM ban to Farm Bill. Cynthia McKinney: Listen to advocates in Israel & Palestine, not to AIPAC. Cynthia McKinney: Repeal NAFTA & CAFTA to address immigration problems. Ralph Nader: Instant Runoff Voting makes all votes count. Cynthia McKinney: we have not had truth about September 11. Cynthia McKinney: Don�t give up liberty in exchange for security. 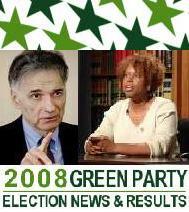 Ralph Nader: Greens focus on substance; day-&-night vs. major parties. Cynthia McKinney: Immediate withdrawal from Iraq & from rest of world. The above quotations are from Green Presidential Debate moderated by Cindy Sheehan, Jan. 13, 2008.